A 6.0 Magnitude Earthquake Struck Near Fiji in the South Pacific Ocean. | Chaos Sweeps Away the World We Know! The Disaster, current events & Catastrophe Blog. Forecasts for 2014 to 2022. Read tomorrows news today! Plus current economic, commodities, stock indices and financial news. ← Coment Elenin Demolished by the Sun! October 27, 2011 – A 6.0 Magnitude earthquake struck Near Fiji: Today’s 6.0 magnitude (M) tremor occurred at a depth of 610 kilometers (380 miles). Because of the extreme depth, the quake was felt over a wide area, however, no tsunami warning was issued from the Pacific Tsunami Warning Center. This region of the South-West Pacific Ocean sits near the “Ring of Fire” and is, therefore, very earthquake prone. 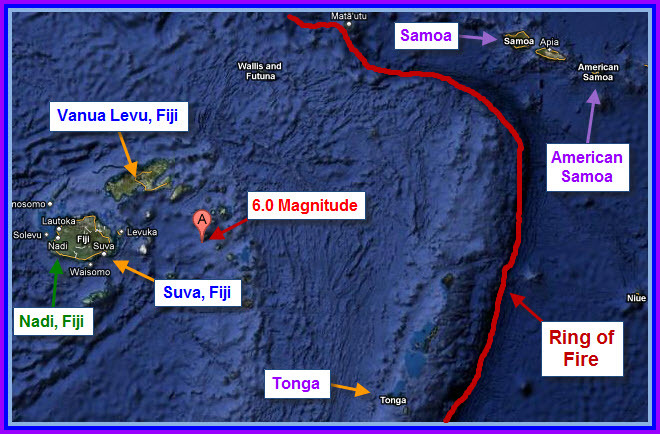 Their was a 7.2M quake near Nadi, Fiji (see map) on September 15, 2011. Of the 346 earthquakes of magnitude 7.0M or greater, that have occurred since January 1, 1973; 31 have been in this area as follows: New Zealand 14, Tonga 6, Fiji 6 and Samoa 5. Today’s quake was 129 miles south-east of Vanua Levu, Fiji; 142 miles east of Suva, Fiji; and 1,352 miles NNE of Auckland, New Zealand. The tremor occurred at 12:15PM (October 27th) near the epicenter. Because of the International Dateline, it was 8:15PM (October 26th) in New York, 7:15PM in Chicago, 6:15PM in Denver, and 5:15PM in Los Angeles. This entry was posted in American Samoa, Earthquake, Fiji, Misc, Miscellaneous, Nature, New Zealand, News, Pacific Ocean, Ring of Fire, Samoa, South Pacific Ocean, The Kingdom of Tonga, The Ring of Fire and tagged 6.0 magnitude earthquake october 27 2011 near Fiji, american samoa, auckland new zealand, fiji, nadi fiji, new zealand, samoa, suva levu fiji, the kinkdom of tonga, The Master of Disaster, The Ring of Fire, tonga, vanua levu fiji. Bookmark the permalink.